Suffolk province is now just over half way through its 2019 Festival period and things are definitely hotting up. This year, six lodges achieved grand patronage status, exceeding their targets, and many more are closing in. Every part of the province is playing its part, with many significant individual efforts are taking place. Andy Gentle has promised to cycle to every lodge in the province during the Festival, with a fundraising goal of £15,000. 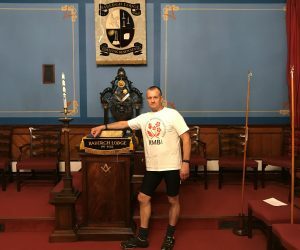 To date Andy has covered 1,749 miles and visited 55 out of the total of 68 lodges in the province and in the process, picking up the broken column in each lodge visited. So far Andy has managed to raise £12,305 towards his target. As 2019 draws closer, the pace is picking up with several notable events planned. The next two years will see much more activity and the enthusiasm to just get on with it is undimmed.